A beautiful European praying mantis rests on a holly shortly before laying her eggs. One of the favorite traditions of the holiday season in western culture is the cutting of an evergreen tree to adorn a home.This week we visit three endearing creatures who are occasional stowaways on an evergreen tree when it enters the home. These hitch hikers belong to a group of predators known as mantises. The name Mantis comes from the ancient Greeks who used mantis to describe a soothsayer, one that could see into the future. 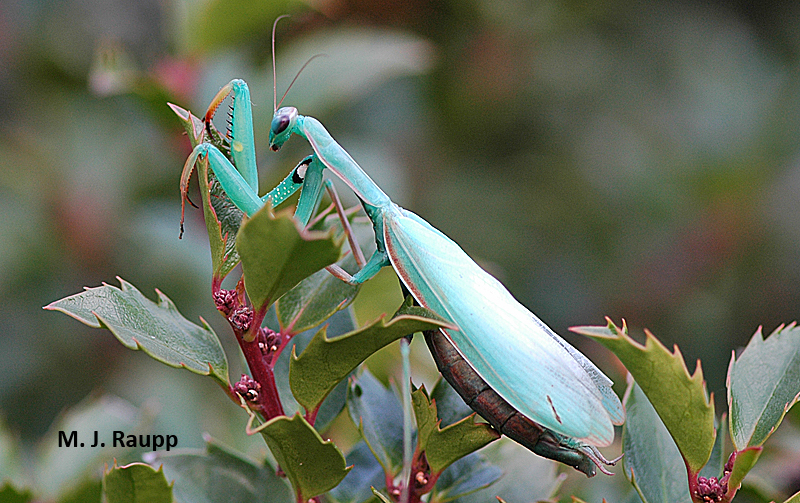 One of my favorites is Mantis religiosa, a native of Europe where it goes by the name of praying mantis. Since its introduction to North America in the 1890’s, this magnificent creature has spread throughout much of the United States and it is now distributed east of the Mississippi and northward into Canada. An ootheca of the Chinese praying mantis snuck into my home on vine of bittersweet. Another common exotic predator, the Chinese mantis, was discovered more than a century ago on October 16, 1897 when Mr. Joseph Hindermyer found a large insect “resting on the upper part of this tomato vine” in Mt. Airy, a suburb of Philadelphia. Fortunately, Philip Laurent, Hindermyer’s neighbor and a member of The Academy of Natural Sciences in Philadelphia recognized this large insect to be an extraordinary mantis and learned that it was an exotic species,Tenodera sinensis, known from China and Japan. How it arrived in Mt. Airy remains shrouded in mystery, but Laurent noted that a large nursery, Meehan and Sons, in nearby Germantown procured many plants from China and Japan. Could it be that this marvelous predator arrived as an embryo in an egg case on a Japanese maple? Perhaps, and in the intervening century the Chinese mantis has enjoyed many delectable treats ranging from unfortunate mates to one of its favorite meals, an old friend from Asia, the Brown Marmorated Stink Bug. Several folks have noted its predilection for these stinky home invaders, which are consumed with great gusto. A gorgeous Carolina mantis waits for a meal or perhaps a mate who might be a dinner guest. European and Chinese mantises are well known sit-and-wait predators and kin to other mantises such as our native Carolina mantis, Stagmomantis carolina. This smaller grey or brown mantis ranges from New Jersey, south to Florida and west to Arizona. Like other mantis species, Carolina mantises eat a wide variety of insects and spiders found in gardens and landscapes. All of these spectacular predators endure winter as eggs with more than 100 brothers and sisters in a brown styrofoam-like egg case called an ootheca. In autumn, a female mantis deposits one or more oothecae on upright vegetation such as branches of trees or stems of meadow plants. With the return of warm weather and small insects in spring, tiny mantises hatch and emerge from the egg case to search for prey. If your Christmas tree has an ornament like this, you may have a holiday surprise! Tiny Carolina mantises emerge from their egg case in spring and hunt small insects. However, if an unwitting female happens to deposit her ootheca on the bough of a Christmas tree, don’t be surprised to see hundreds of tiny mantises decorating your tree before the arrival of New Year! While this rambunctious brood will cause you no harm, with no other prey around their wanton acts of cannibalism clearly violate the joyful spirit of the holiday season. So, if your holiday tradition includes bringing an evergreen tree or other vegetation into your home, invest a moment for a quick inspection. If you discover unexpected ornaments in the form of oothecae, be sure to carefully pluck them off and put them outdoors where they will deliver a surprise for unsuspecting prey in your landscape next spring. Although this video has little to do with the story, it is always entertaining to watch a Chinese mantis eat a Brown Marmorated Stink Bug! We thank Dr. Shrewsbury who provided the inspiration for this episode. Two delightful articles “A species of Orthoptera” by P. Laurent and “Ecological Consequences of Food Limitation for Adult Mantids (Tenodera ardifolia sinensis Saussure) by R. M. Eisenberg, L. E. Hurd and J. A. Bartley were used to prepare this episode.